PG&E’s commitment to sustainability shapes how we assess and manage our supply chain priorities and processes. It affects how we select, engage with and manage these business partners, and influences our product and service choices and strategies, which helps PG&E to better serve our customers and supports our goal of environmental leadership. Since 2007, we have encouraged environmental responsibility, excellence and innovation among our suppliers. Our approach focuses on advancing the performance of our top-tier suppliers—approximately 100 critical firms that represent about 60 percent of PG&E’s $5 billion annual spend. Implement an Environmental Management System and track greenhouse gas emissions (Scope 1 and 2), energy use, water use, waste and compliance with environmental requirements. Set voluntary reduction goals in three of the following areas: greenhouse gas emissions (Scope 1 and 2), energy, water and waste. Publicly report their performance against the goals. We conduct annual evaluations of each top-tier supplier on key performance indicators, including safety, product quality and operations, diversity and environmental performance. We work with suppliers to drive continuous improvement and provide training to all suppliers on PG&E’s expectations and systems for improving sustainability management. Additionally, we provide one-on-one coaching and mentoring to suppliers that need additional support. Since 2007, PG&E has been working to advance sustainability within our supplier network. Reduce resource consumption through our product choices. Where there is no feasible option to reduce consumption, buy products and equipment with a lower environmental footprint. PG&E continues to partner with industry peers through the Electric Utility Industry Sustainable Supply Chain Alliance, a consortium of utilities that PG&E cofounded in 2008 to advance sustainable business practices among utility industry suppliers. The Alliance provides a forum to benchmark our performance and share best practices in areas spanning from fleet operations to life-cycle assessment. 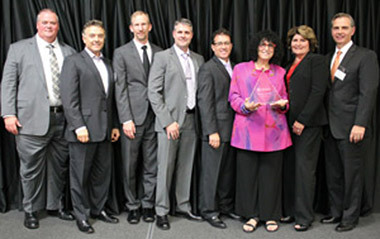 PG&E’s Green Supplier of the Year Award recognizes suppliers that demonstrate excellence across a broad spectrum of environmental factors. Richard Heath & Associates, Inc., which administers PG&E’s energy efficiency program for low-income customers, received the award in 2014. The company has been a critical partner, helping customers achieve energy savings in communities in need. Expanded the scope of our program. More than 100 suppliers were assessed using our supplier environmental performance survey and scorecard of key performance indicators, and were offered one-on-one mentoring. Delivered customized training. We delivered training on PG&E’s sustainability requirements to our top 300 suppliers and community-based organization partners. We also delivered training to key internal partners on the importance of supply chain sustainability and their role in driving further progress and innovation. Led continuous improvement projects. We initiated several projects with environmental and business benefits, including research to reduce hazardous chemicals, creating an online compendium of energy efficiency best practices for suppliers and developing environmentally preferable purchasing specifications for office and facility commodity purchases. To rate suppliers’ performance relative to our Supplier Environmental Performance Standards, as well as identify areas for improvement, PG&E uses supplier responses to an annual survey conducted by the Electric Utility Industry Sustainable Supply Chain Alliance. In 2014, PG&E achieved a 100 percent response rate from surveyed suppliers for the third consecutive year. PG&E’s 2014 target was for at least 60 percent of top-tier suppliers to achieve a score of three or higher on a five-point scale. PG&E exceeded that goal, with 72 percent of suppliers meeting the standards. To maintain this progress, PG&E set a goal of 65 percent for 2015. The following chart shows the progress in reported performance among top-tier suppliers between 2010 and 2014 against our Supplier Environmental Performance Standard. Additionally, PG&E’s suppliers have demonstrated leadership among Alliance suppliers in tracking environmental impacts and setting voluntary reduction goals. We will continue to work with our suppliers to achieve mutually beneficial sustainability goals by launching new training and working with our top-tier suppliers to engage their supplier networks on sustainability. We also plan to strengthen our internal engagement to drive strategies that help reduce PG&E’s environmental footprint. This includes new projects that will compile sustainability best practices for construction contractors and enhance procurement processes for environmentally preferable products.